1/35 German Sd. Kfz. 7/2 3.7cm FlaK 36 Model Discounts Apply ! DRA6541 - 1/35 German Sd. Kfz. 7/2 3.7cm FlaK 36 Model. The Sd.Kfz.7 was a German halftrack in the 8-ton prime-mover class that saw widespread service in WWII. The Sd.Kfz.7 was a German halftrack in the 8-ton prime-mover class that saw widespread service in WWII. Weighing in at 11.53 tonnes, it was originally slated to tow artillery pieces like the 8.8cm Flak gun and 15cm sFH 18 howitzer. However, it was also developed into a successful self-propelled platform for anti-aircraft weapons such as 2cm or 3.7cm cannons for Luftwaffe flak units. The vehicle carrying the latter 3.7cm cannon was known as the Sd.Kfz.7/2, and a total of 123 vehicles were produced up till February 1945. Dragon has already released a 1/35 scale plastic kit of the Sd.Kfz.7/2 with 3.7cm Flak 37 cannon, this particular halftrack boasting a lightly armored cab (Item No.6542). This armored Sd.Kfz.7/2 halftrack version appeared from late 1943 onwards. Now Dragon introduces an Sd.Kfz.7/2 with the standard non-armored cab. 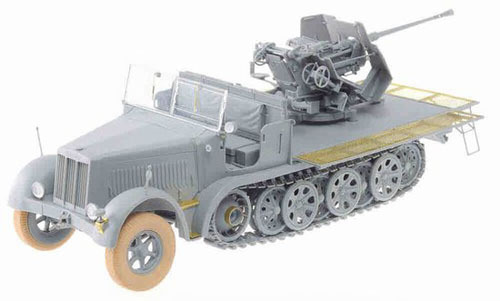 The vehicle features the correct rear firing platform for a 3.7cm Flak 36 cannon. Just like the real vehicle, the rear sides fold down to create a larger fighting platform to depict a combat configuration, or they can be left folded up for travel. The mesh for these side panels and tailgate are made accurately to scale using photo-etched parts. Other parts such as the one-piece cannon barrel with hollow muzzle use slide molds to produce accurately formed shapes. The intricate tracks are Magic Tracks for ultimate ease of use, while the front tires made from DS bear accurate tread patterns. This new 1/35 kit gives modelers an extra option when they plan their next diorama. Indeed, it would be an interesting exercise in itself to gather Dragon's Sd.Kfz.7 clan together to spot the differences between these superb halftrack kits.